History: (What If? II#11/3) - When their experimental rocket crashed to Earth after being bombarded with cosmic rays, Ben Grimm, Reed Richards, Johnny Storm, and Sue Storm found themselves transformed by the radiation into monstrous creatures. Blaming Reed for their predicament, Ben began to fight with Reed, until Johnny broke up the fight, pointing out Sue's transformation. Sue had become a mindless, swamp-like creature, who could not even speak. Reacting quickly, Reed ordered the others to grab Sue and demanded that they get back to his lab immediately. On the way to the lab, a group of police officers stopped them and asked for their identification, to which Reed replied by smashing their police squad car. Once inside, Johnny told Ben that their Midtown apartment was no longer a place for them. Reed then showed them his prototype long-range flying car, which he asked Ben to pilot. Ben agreed and in mid-fight, Ben asked where they were flying to. Reed replied that they were going to the only place they could live safely, due to their appearances: Monster Isle. Comments: Created by Jim Valentino and Steve Montano. 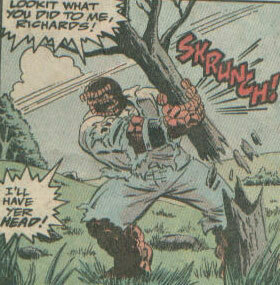 This reality diverged from the events in Fantastic Four I#1 (November, 1961). One thing of note: This alternate reality was officially designated Earth-9033 in the Marvel Encyclopedia Vol. 6: Fantastic Four. Following his transformation, Ben looked like his Earth-616 counterpart, the Thing. He, along with Johnny, seemed to be the most rational of the group following their transformations. 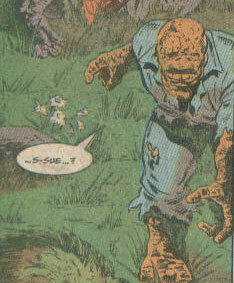 After the transformations, Reed resembled a gray-skinned behemoth, similar to his Counter-Earth counterpart, the Brute. He became more and more irrational as time passed after his transformation, but he introduced the team to his prototype flying car, which took them to Monster Isle. 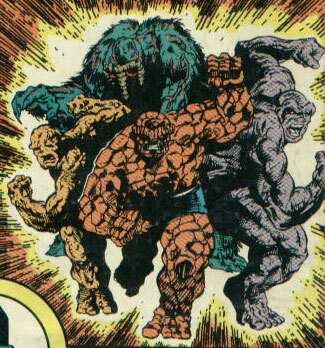 After being hit with cosmic rays, Johnny Storm transformed into a rock-like creature, similar to the way the Thing looked in Fantastic Four I#1, all lumpy and such. When the team returned to Reed's lab in Midtown, Johnny commented that Midtown was no longer a place for them. When Sue was bombarded with cosmic radiation, she transformed into a swamp-like creature, similar to Earth-616's Man-Thing, only female. She did not show any specific abilities or even intelligence, as she was unable to speak in this form. The others devoted themselves to protecting her life at all costs and she eventually joined them in travelling to Monster Isle.